In 3-quart saucepan, cook spaghetti as directed on package, adding peas during last 2 minutes of cooking time. Drain; return to saucepan. Meanwhile, place bacon on 2 microwave-safe paper towels and lay on microwave-safe plate. Microwave on High for 2 to 3 minutes or until crisp; crumble. 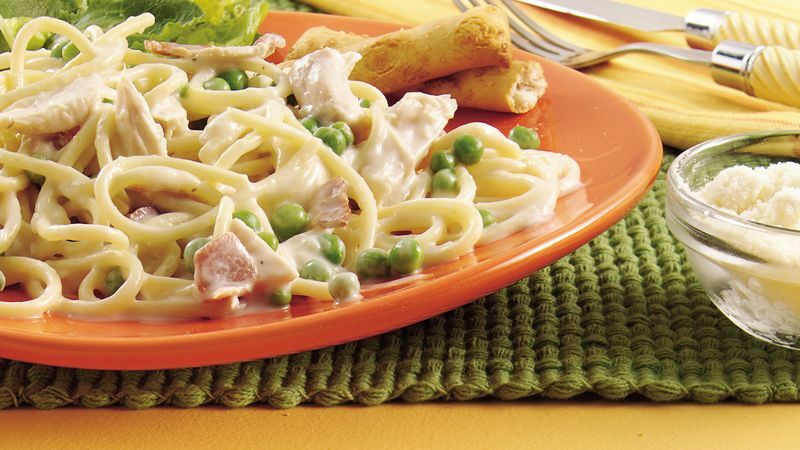 Stir bacon, chicken and Alfredo sauce into cooked spaghetti and peas. Cook over low heat about 5 minutes, stirring occasionally, until thoroughly heated. Sprinkle with cheese. Just-purchased rotisserie chicken should still be hot when you get it home. Let it cool about 15 minutes before removing the skin and bones.